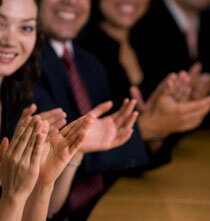 Applause from our clients for our MarCom and project management expertise. "Whenever I need marketing assistance, I immediately call Deborah Hoard of Net Results. I count on her to provide the MarCom expertise I need for my projects. And I've never been disappointed." "An experienced project manager is a critical link to the success of any creative services project, and Deborah Hoard of Net Results has proven her worth many times over. Her cool head, creative solutions, and ability to manage all of the "moving parts" were key in producing successful results. I look forward to having her as part of our team on future projects." "I needed someone immediately who I could count on to take charge of the marketing communications for our new Consumer Electronics division on a short-term basis. To make it even more challenging, this person had to swim through murky political waters during a major corporate merger. Deborah Hoard of Net Results stepped right in and helped us launch 9 products within 5 months and was instrumental in smoothing the transition process." "Net Results will always be at the top of my contact list when I'm looking for a great problem solver. We needed to develop an Intranet site that contained tools to assist our sales force in closing deals more quickly. With very little direction, Deborah Hoard did a terrific job working with our internal team to create a site chock full of useful information that has received high marks from the sales team." "As with most start-ups, we had critical MarCom projects that needed to be completed immediately and not enough bandwidth internally to do so. I knew I could trust Deborah Hoard from Net Results to take the projects and run with them. She was able to navigate through the unique challenges of a start-up and completed the projects to stellar results." "We had a series of six back-to-back product launches and called in Net Results to manage the production of the marketing materials. They developed a streamlined procedure that reduced our time and costs and enabled us to successfully launch one product after another." "Net Results helped us transform our old, confusing Intranet site to one that successfully showcases our services. Working with 7 very busy content owners and a team of Web developers, Deborah Hoard was able to create a user-friendly, robust site. Because the site can now be used as one of the key vehicles for communicating with our clients, it has freed our time and enabled us to provide better, more focused service." "We were developing a completely new external web site  with over 300 pages of new content, design, and supporting navigational structure. Under the guidance of the original project manager, the team's efforts were fractured and the site was in serious jeopardy. We brought Net Results onboard and, within a few weeks, they took the lead on the project and cultivated a renewed team focus and delivered on time. We not only had a successful launch, the Web site has since won two industry awards!" "We needed someone to work with our VP to create an internal monthly online newsletter to provide cross-communication among our international HR departments. Deborah Hoard of Net Results was able to supply writing services and develop a process that ensured smooth newsletter production and delivery. The program received rave reviews from the various HR departments and enabled them to create closer and more productive working relationships." "I needed someone to manage multiple projects with rapidly approaching deadlines. The tasks included creating a new Web site and developing a full set of sales tools. Deborah Hoard of Net Results was able to immediately step in, take over responsibility for all of these projects, and quickly drive them to extremely successful completion."